Many flight attendant jobs happen behind the scenes and when you're not paying particular attention. Business Insider shadowed Robert "Bingo" Bingochea, a Denver-based flight attendant for United Airlines, for a day to see what we're missing. Take a look at what United flight attendants have to do to help get the plane in the air. The next time you fly, try and take notice of what your flight attendants are up to. I guarantee you what you see isn't even half of it. A flight attendant's job isn't simply showing you where to put your bags, giving safety demonstrations, and pushing beverage carts up and down the aisle. In fact, much of a flight attendant's job happens before you even board the plane. While every day on the job is different, there are a number of things flight attendants have to do behind the scenes to help get the plane off the ground and keep everything humming along smoothly throughout the flight. To find out just what's going on that we don't get to see, Business Insider shadowed Robert "Bingo" Bingochea, a Denver-based flight attendant for United Airlines, who's been flying with the company for seven years, on his trip from Denver to Houston and back. Here are some of the things you probably don't realize flight attendants are doing behind the scenes. As a passenger, you won't ever see United's operations station, home of United's conference rooms, HR and IT departments, and Inflight Services, in Denver International Airport. We meet there to begin our journey together. During check-in with Inflight Services, Bingochea lets the staff know he's physically there and ready to go. "They cover their bases because the plane has to be out," he says. "You can't be late. You can't be looking for coffee. You have to be there on time." He can also find out more about his trip at check-in. But Bingochea says he never looks to see what crew members he's flying with. "I never do, because I'll fly with anybody. And a lot of people say, 'Well, I don't want to fly with so and so.' To me, that's just too much work," he says. Flight attendants are trained to know every position, Bingochea says, and once you've achieved a certain level of seniority, you can bid for certain trips and positions. "I don't pick which trips I want to work, and I don't pick positions I want to work," he says. "I like working everything." He says changing positions all the time helps keeps him on his toes. And he doesn't have a preference for class, either. "People are people, whether they're in first class or economy," he says. Once Bingochea and his fellow crew members have boarded the plane and stowed their baggage, they take part in the pre-flight briefing. Apart from addressing logistics and procedures, the crew can also get to know each other a little better during pre-flight briefings, as they likely haven't traveled together before. Captain Bob inquires about the pin on Bingochea's lapel, which bears the Great Seal of the United States. Bingochea reveals that it was given to him by President Clinton aboard Air Force One in the 90s during time he spent working with Sen. John McCain, and the two bond over their common government work background. It's time for the flight attendants to do their preflight checks at their assigned crew stations. For our almost 200-passenger flight, there are four flight attendants: two in the front of the plane and two in the back. Since Bingochea is assigned the FA01 position, he's responsible for checking the emergency equipment at his station in the back galley, in the bathroom, and in the overhead bins at the back of the plane. Bingochea also checks the door to ensure it has sufficient pressure should we need to evacuate. "This is the ultimate decision here, as I like to call it," he says. "If we have to go for these doors, we're going to be ready." Bingochea says that, every once in a while, the Federal Aviation Administration will take something out of the airplane to see whether flight attendants are checking everything thoroughly. Bingochea says that during boarding, he often feels a little anxious. "Getting a flight out safely and on time requires lots of people and many steps," he says. "If one of those steps doesn't happen properly, that might delay us a bit." Bingochea and his coworkers have a great deal of information for and about passengers right at their fingertips. If passengers want to upgrade to "economy plus" during boarding, for example, Bingochea can accommodate the request using a proprietary app on his handheld device called Link. He can also use the Link app to check passengers' reservations, including whether they have a connecting flight they need to make, as well as their flier status, and he also uses the app for food and drink sales. If something does go wrong, Bingochea says, flight attendants are empowered with resolution options, from offering a free drink or meal to updating fliers and giving them more points. "We can't fix everything, but at least we can try to give it a chance and try to make things acceptable," he says. 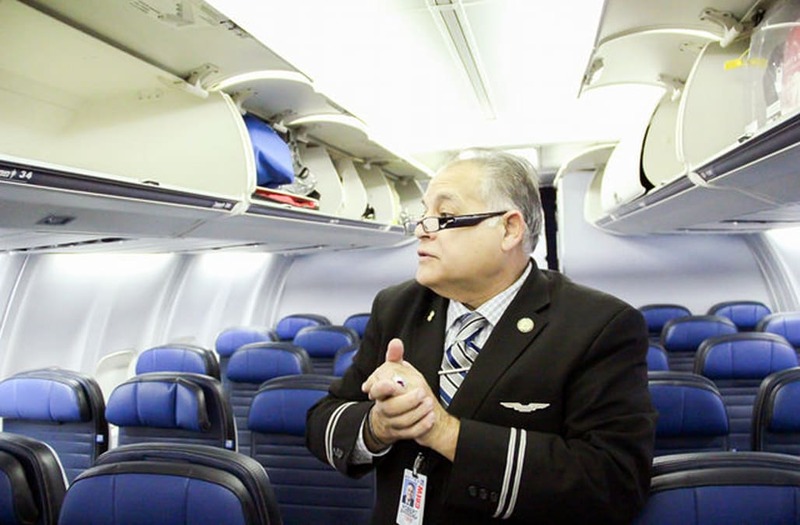 Once the doors close, Bingochea and his fellow flight attendants are finally on the clock. In a series of calls, the head flight attendant lets the rest of the cabin crew and the first officer know that the cabin is ready, the doors are armed, and the plane is ready to push back from the gate, as well as approximately how long the taxi will be. "Communication is everything here," Bingochea says. "It has to be paramount, because, as Mr. Munoz said years ago, a serious of small mistakes is the beginning of a big mistake." After a safety briefing and a final check to see whether seat belts are fastened and personal items are stowed properly, the plane is ready for take off. The captain alerts flight attendants to be seated for departure. "You go through the different situations that can happen in your head, he says." As the plane levels off, Bingochea and Kristine prepare the beverage cart, shuffling around each other and the bar cart in the tiny box that is the galley. As it's a morning flight, they stack the cart with coffee, juice, and water. And since most passengers are sleeping, they anticipate a fairly easy service of no more than 20 minutes. On busier daytime flights, it can take an hour to get to all the passengers. owards the end of the flight, once we're below 10,000 feet — which is indicated with a ding everyone aboard the plane can hear — we've entered final descent, and everything has to be buttoned up. At this point, flight attendants perform another safety check in preparation for landing. Final descent is also considered a "sterile period," meaning the flight deck is concentrating on landing the plane, and the cabin crew is not to communicate with it during this time. After less than 45 minutes in George Bush Intercontinental Airport in Houston, we board our next flight to head back to Denver on the second leg of our trip to do it all again. There's more to being a flight attendant than meets the eye.